The first weekend in November in our corner of western Massachusetts is reserved for Cider Days, our annual celebration of the end of the apple harvest. Events are scheduled all over Franklin County this year. They will include a special tribute to the late Terry Maloney of West County Cider, who started this festival in 1994 with his wife and business partner Judith. Local food lovers should plan on attending some of the events on Saturday and Sunday, which include orchard tours, cider-based meals, and (my personal favorite) a cider salon. I am lining up some cider and apple recipes for the West County Independent. They will doubtless find their way onto these pages eventually. Meanwhile, here is a preview to get you in the mood. These apple fritters are the brainchild of Sheila Velazquez of Pen and Plow Farm in Hawley, Massachusetts. The recipe couldn’t be simpler. If you slice the apples quite thin and make sure the batter is spread throughout the apple pieces, you get a lovely combination of sweet and tart, crispy and slightly soft. The fritters can be used as an accompaniment for pork or stew—or as a simple dessert or breakfast treat. Sheila says she omits the sugar and uses this same recipe for corn and zucchini fritters. I can’t wait until next summer to try those. The apple version is absolutely addictive. In a bowl whisk together the flour, the baking powder, the salt, the sugar, and the cinnamon (if you are using it; I loved it). In a smaller bowl whisk together the milk and egg. Add the wet ingredients to the dry ones and stir just until they are blended. If your batter is a little too wet, add a tiny bit of flour; if it’s dry, add a small amount of milk. Toss in the apples, trying to coat them lightly but thoroughly. Cover the bottom of a nonstick frying pan with oil and heat it until the oil shimmers. 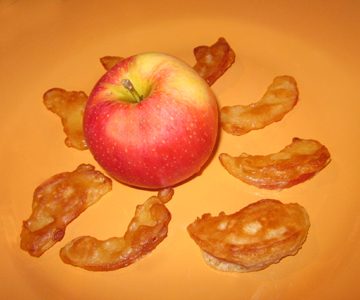 Pop in a few apple pieces at a time and reduce the heat so that the fritters won’t cook too quickly. 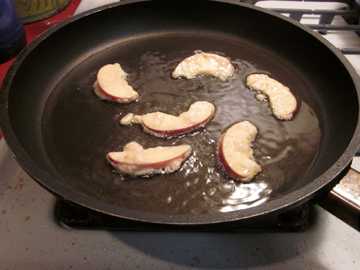 Fry the apple fritters on one side; then the other. Keep the fritters in a warm oven until their relatives are ready to serve. Or just dole them out to those waiting eagerly at the table as they are ready. This entry was posted on Friday, November 5th, 2010 at 4:00 am	and is filed under Apples and Cider, Autumn, Breakfast and Brunch. You can follow any responses to this entry through the RSS 2.0 feed. You can leave a response, or trackback from your own site. While you can fry individual slices, I like dropping in a couple of tablespoons of batter to make small pancakes. Goes faster and uses less space. These can’t be too large or thick, but more like a small potato pancake. I promise to try them with your addition of cinnamon next time. These sound good. I’ll have to try them. I wanted to tell you that I followed Matt’s comment to his website; read one of his postings which was about a guy from my hometown of Corning! Such a small world! Oh, how cool! I bet these are delicious and they sound so easy to prepare! Thanks Tinky! Sheila, I promise to try them your way–although the slices were pretty darn terrific. Matt, bless your heart! Ramona, I love these coincidences. EveryDay, they are easy indeed. And Frayed, I am now craving banana fritters, darn it! Isn’t fruit the most delicious of all foods? I just can’t get enough of it! As you may notice, I am going from present to past in your blog entries. This is great, and I have copied and saved it. Can’t wait to make them. Thank you, thank you.